I come by my love of the “Die Hard” franchise honestly. I saw the original “Die Hard” during its original theatrical run in the summer of 1988 at least half a dozen times. It’s a movie that did a lot of amazing things: it launched the career of Bruce Willis who up until then had been known as the star of a comedic private eye show called “Moonlighting.” It created an entire sub-genre of action movie. For years afterwards movie theaters were flooded with copycat movies about a lone hero, isolated from any help having to fight off an army of well-armed opponents. But “Die Hard” remains at the top of the pyramid. Many people consider it the greatest action movie ever made. For me it’s the second greatest (sorry, folks, but for me nothing beats John Woo’s “Hard Boiled”) and it is certainly one of my favorite Christmas movies. Naturally a movie as extraordinarily successful as “Die Hard” has to have sequels. “Die Hard 2: Die Harder” is almost as good as the first but for me “Die Hard With A Vengeance” is my favorite and in some ways I think it’s a better movie than the original. “Live Free or Die Hard” came under a lot of heat from fans of the series as well as critics as now John McClane wasn’t just a New York cop with a stubborn streak that can’t be broken. He got elevated to superhero status, saving the entire country from a cyber-terrorist attack. 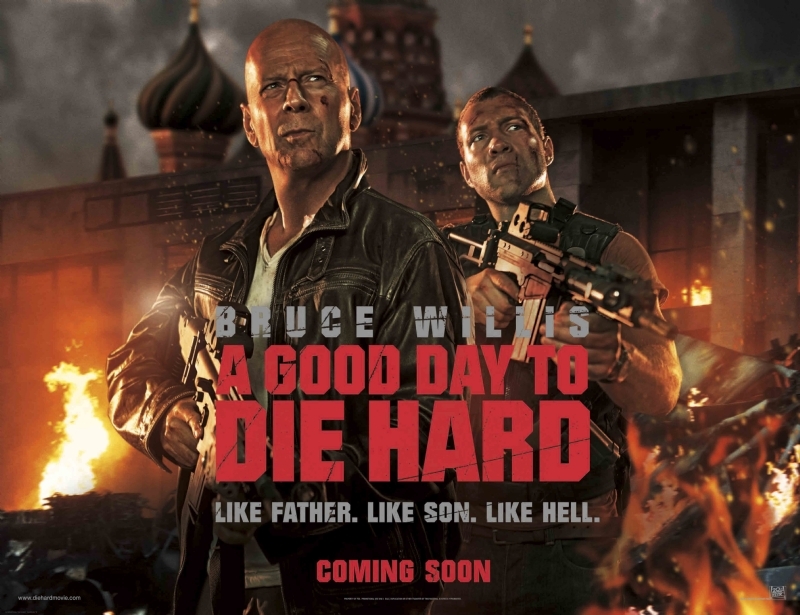 I’m not as hard on “Live Free or Die Hard” as I’m going to be on A GOOD DAY TO DIE HARD because the one thing “Live Free or Die Hard” has in common with all the other movies in the series that A GOOD DAY TO DIE HARD doesn’t have is that it’s fun to watch. 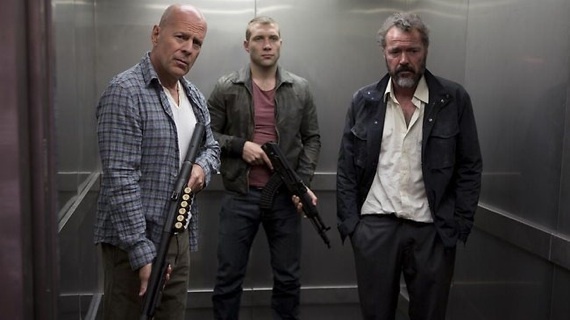 NYPD detective John McClane (Bruce Willis) learns that his son Jack (Jai Courtney) is imprisoned in Russia for a multitude of crimes, including murder. John heads to Russia to help his son out, despite the fact that they haven’t spoken in years. John arrives at the courthouse just in time to see Jack escape with Yuri Komarov (Sebastian Koch) a whistleblower who has a secret file containing damning evidence against Komarov’s former partner Chagarin (Sergei Kolesnikov) The evidence concerns secret sales of weapon grade plutonium that could put Chagarin behind bars for life. It turns out that Jack McClane is a CIA agent who has been undercover for three years, working to get close to Komarov so that the CIA can get their hands on the file and the plutonium. Jack’s partner is killed and his cover compromised. The only ally he can now rely on is the father he can’t stand. Lucky for him his father has been doing this kind of thing for 25 years. 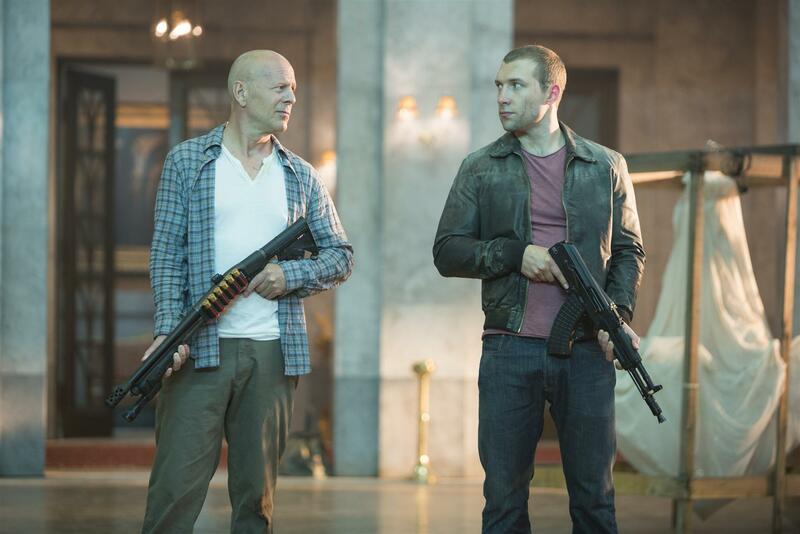 Being outnumbered and outgunned is nothing new for John McClane and his son is a quick learner. My main problem with A GOOD DAY TO DIE HARD is this: John McClane in his previous movies is a regular guy. He’s just a cop who has the misfortune every so often to find himself in opposition against enemies who are better equipped and yes, smarter than he is. The main thing John McClane has going for him is his never-say-die-never-give-up Die Hard spirit that pulls him through his harrowing, bloody adventures. John McClane is a reluctant hero who gets involved in thwarting the grandiose schemes of the bad guys simply because there is nobody else around to do so. Remove that element from the character and there’s something really vital and essential missing from the character’s makeup. We don’t get that John McClane here. There’s a part in the movie where it’s made pretty clear that there’s nothing left to be done and John can take his son and go home. His decision at that point in the movie is pretty arbitrary to me. But we’ll argue about that after you see the movie. What else didn’t I like? The “Die Hard” movies all had memorable, entertaining supporting characters and villains. Not so here. In fact the villain’s plan in this movie is so unnecessarily complicated that I get a headache thinking about it. McClane doesn’t have a sidekick anywhere near the level of Sgt. Al Powell, Zeus Carver or Matt Farrell. The relationship with his son didn’t convince me at all. Bruce Willis and Jai Courtney have no chemistry together and certainly they ain’t no Sean Connery and Harrison Ford. I heard that at one point there was consideration that the mother of the Gruber brothers would be the villain in this movie. Anything would be better than the villains we get in A GOOD DAY TO DIE HARD. There’s nothing remarkable or flamboyant or memorable about them. But there are a whole lot of ‘em to kill off, I’ll say that for ‘em. What did I like? There are some really eye-popping action sequences. But they’re so eye-popping that they make the stunts in the original “Die Hard” seem downright realistic. Remember in that one, John McClane ran over broken glass with bare feet and through the rest of the movie they bled? In this movie McClane jumps through at least three plate glass windows without a scratch. If you’re looking for nothing but action, you will be more than satisfied. I got no complaints with that aspect of the movie. But I just didn’t get the same feeling of fun and excitement from A GOOD DAY TO DIE HARD I get when I watch the previous “Die Hard” movies, It’s a solid, professionally made action movie that delivers the goods. But it’s a disappointing “Die Hard” movie. I’m with you on DIE HARD 4. I only saw it in the theater and haven’t seen it since, but I remember enjoying it well enough.